Are you looking for a game that's fun for all ages and occasions? Perhaps it's time to unplug your kids from the TV or computer so they can get some outdoor fun whilst improving their motor skills? Or maybe you are after some awesome family fun so you can spend more time with the kids? Well, look no further as the "Loop & Hoop" ring toss game is just the answer you need and much more. Ring toss games are becoming a crowd favorite and whilst they were originally designed for carnivals and local fairs, they are now becoming the number one activity game for many households. Not only are they fun for everyone, from kids through to the elderly, the games you can play will also help improve hand to eye coordination which is essential for children as they grow. We're so confident you'll love the "Loop & Hoop" ring toss game that we back it with a no questions asked money back guarantee. So try it risk free by adding to cart now. FUN FOR THE WHOLE FAMILY - Ring toss games are fast becoming the number one activity based game for the home. It's will provide hours of awesome family fun with the kids and it's also perfect when you're hosting or entertaining. Indoors or outdoors, children and adults love the variety of games you can play (instructions and rules for many game types, even quoits included). IMPROVES HAND TO EYE COORDINATION FOR KIDS - Whilst it's great fun for everyone, this ring toss game will also help develop hand and eye coordination skills so it's great for children and seniors alike. Whether it's writing skills through to sporting capabilities, this game can be used to improve base motor skills. 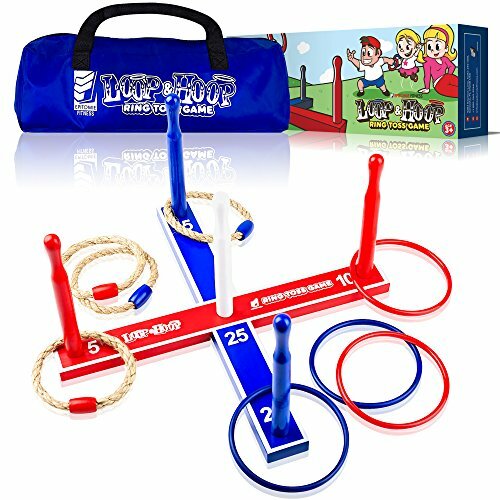 HIGHEST QUALITY RING TOSS GAME IN THE MARKET TODAY - The Loop & Hoop ring toss set uses the best materials of any ring toss game in the market today. With a sturdier base and metal screws, along with high grade plastic rings and denser hemp rope quoits rings, once you receive the set, you will notice the premium difference and the higher quality. TAKE IT WITH YOU ANYWHERE - Whether it's for house hold parties, at the beach or the snow, around a camp fire, or just in the back yard, this ring toss / quoits game will provide loads of entertainment value. Take it with you in the high quality carrying bag included with the package (see photos). MONEY BACK GUARANTEE - The Loop & Hoop ring toss set is a best seller in many local retail stores so we know your family will absolutely love it. However, if for any reason you are not 100% satisfied, know that we back it with a 100% no questions asked money back guarantee. Just message us and we'll fully refund you so add to cart totally "risk free". If you have any questions about this product by Epitomie Fitness, contact us by completing and submitting the form below. If you are looking for a specif part number, please include it with your message.